How an Ultrasonic Transmitter and Receiver Work? Ultrasonic sound is a cyclic sound pressure with a high frequency than the upper limit of human hearing equal to 20KHz. Some animals like dolphins, mice, dogs, and bats have a high- frequency limit that is larger than that of the human ear & thus can hear ultrasound. This sound is very low in humans even at high intensities. 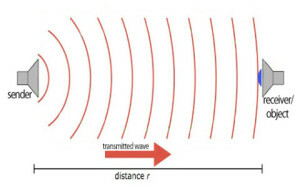 Ultrasonic waves are found in wide industrial applications such as nondestructive testing of object is illuminated with ultrasonic waves and a repeat of the transmitted waves specifies a flaw, ball bearings, surgical instruments, Fine machine parts & several other objects can be cleaned ultrasonically. When the surfaces of metals can be placed in contact with each other, then the metals can be welded and illuminating the contact with ultrasound. The molecules are moved into relocated in the form of crystalline, making a long-lasting bond. Ultrasonic whistles cannot be received by human beings, but loud to dogs and are used to call them. The Ultrasonic Transmitter and Receiver circuit comprises of transmitter and receiver, that operates at the same frequency. When something moves in the area covered the fine balance of the circuit is troubled and the alarm is activated. This circuit is very simple and adjusted to reset it automatically or to stay connected till it is rearrange manually by an alarm. The ultrasonic transmitter is designed with 2-NAND gates wired as inverters and they make a multivibrator the o/p of that drives the transducer. The P2 trimmer changes the o/p of the TX and for high efficiency it must be made the same as the transducer’s resonance frequency in use. The receiver section built with a transducer to receive the indications which are reflected back to it the o/p of which is amplified by the op-amp 741 IC and transistor TR3. The o/p of the op-amp is taken to the non-inverting i/p of IC2.the amplification factor of which is adjusted by means of P1. The Ultrasonic transmitter and receiver circuit is built with 555 timer IC or CMOS (complementary metal-oxide-semiconductor devices). This circuit works with 9 volts to 12 volts DC.These are preset controlled variable oscillators are specific controlled variable oscillators. The working frequencies specific value is likely to drift due to changes in temperature. 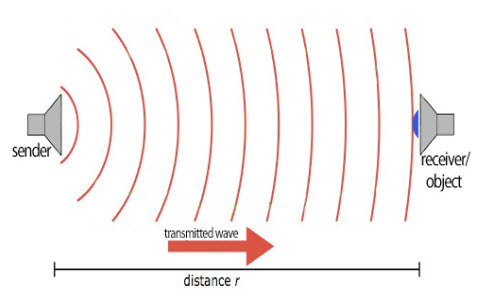 The drift in frequency affects the transmission range from the ultrasonic transducer. The circuit of an ultrasonic transmitter and receiver uses an IC CD4017 decade counter. The transmitter circuit is designed with D- flip flop IC and two-decade counter ICs and a few major components. The circuit design generates stable 40kHz signals, which are transferred by the transducer. The RF oscillator built with transistor T1 to produce an 8MHz signal, that works as an i/p to the first decade counter that is built around IC1. The oscillator frequency can be divided to 800 kHz by the decade counter. The o/p of the first decade counter is fed to the second decade counter, then the frequency can be divided to 80 kHz. The flip flop divides the frequency to half of the frequency of decade counter, then it is transferred by the ultrasonic transducer. The L coil is made with enameled copper wire 36SWG that is looped 15 times around an 8 millimeter diameter of plastic former, which has a ferrite rod and this is used for radio oscillators. 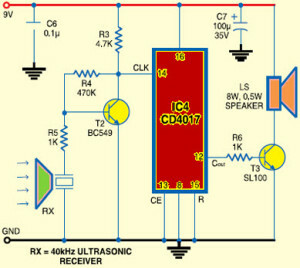 The receiver circuit of ultrasonic is powered by a 9V battery. The ultrasonic receiver circuit is designed with a decade counter IC4 and a few components. The working of the transmitter can be checked by converting the 40kHz signal to 4kHz to bring it in the range of audible sound. By using this receiver circuit, the 40kHz transmitter circuit can be quickly tested. Under test, the transducer in the receiver is arranged near to the ultrasonic transmitter. It notices the transmitted signal (40kHz), that is amplified by the amplifier which is arranged around the BC549 (T2) transistor. This signal is fed to the IC4 decade counter and divides the frequency to 4kHz. T3 transistor strengthens the 4kHz s/L to drive the speaker. House the circuits in separate small cabinets. If the transducer 40kHz under test is working, the receiver circuit generates loud whistle sound . Thus, this is all about ultrasonic transmitter and receiver. We hope that you have got a better understanding of this concept. Furthermore, any queries regarding this concept or engineering project ideas for final year engineering students, please approach us by commenting in the comment section below. Here is a question for you, what are the applications of ultrasonic proximity sensor? Can you please be specific with your query and also let we know the title of the project? Along with,could you please share your contact details? So,that our consultant department will get back to you for providing the appropriate solution. Hello, I am working on my final year engineering project that requires ultrasonic receiver and transmitter in application. Without going too much into detail on my project, I will sum it up by saying that I need to make a dog collar with a transmitter that will communicate wirelessly to the receiver which is an Arduino microcontroller. When the dog gets within 3 feet range, it will signal the Ardiuno. I’m working on a project that requires determining an object’s location in xyz space. The center of the space will be occupied by a hexagonal structure whose sides will be located on known points across the xyz plane.I’ve just begun looking into ultrasonic solutions to this. Height information should be simple to gather but I’m assuming that localization on the planar field would be skewed if the sound is bounced off an angled wall…Thoughts?